I've been using reusable nappies for nearly six years. Around half my stash was bought pre-loved and they are on their third child now. So, as you can imagine, some of them are beginning to show a little wear and tear now! And one of the biggest issues is that the elastic in the waistbands and legs is no longer, well, particularly elastic. A big reason for me using reusable nappies, apart from the money-saving aspect, was because I wanted to be kinder to the environment. So, I just can't chuck the old ones away. Instead, I decided to embrace the make-do-and-mend philosophy and have a go at repairing them. I'm no seamstress, so this was a big challenge. But, I'm pleased to say, it turned out to be a lot easier. This post describes how I repaired the waist elastic in a pocket nappy (I've done a Green Kids and a Happy Heiny). My next challenge is to have a go at leg elastic, which I'll blog about in the near future. 1. Firstly, turn the nappy inside out so you can easily access the waistband elastic. 2. Unpick the stitching at the end of the waistband so you can get to the elastic. The elastic in both nappies was actually stitched through the end of the waistband, so I just cut the elastic as close to the end as I could and then removed the spent elastic. 3. Measur the fresh elastic along the old elastic and cut it to size. 4. Unpick the stitching along the entire waistband. I tried to insert the fresh elastic through the waistband using a small safety pin, but the safety pin was too big, so the shortcut I had hoped for never materialised. 5. Sew the end of the fresh elastic onto the end of the waistband using a lot of stitches - this needs to hold well! 6. 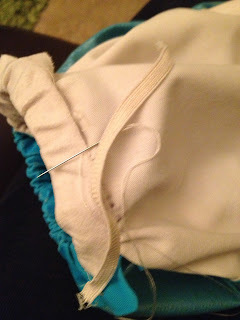 Then stitch the other end of the elastic to the other side of the nappy. 7. Restitch the waistband together again. I used a blanket stitch, but you could probably even use a sewing machine. One of the biggest issues, was trying to ensure the waistband is evenly gathered, otherwise you could end up with some bunching. 8. Turn the nappy back the right way out. And, hey presto - a re-elasticated waist and your re-usable nappies can be re-used again. Have you repaired any of your real nappies? Any tips and hints? Next job is the important leg elastic, to prevent unwanted spills and stains.